This week, the Republican-controlled House of Representatives began work on a budget reconciliation bill that eliminates federal funding for Planned Parenthood for one year and repeals some components of the landmark 2010 Affordable Care Act (ACA). This reconciliation measure represents a key part of the congressional leadership’s plan to avoid a government shutdown: promise the Planned Parenthood opponents that their concerns will be addressed in a filibuster-proof reconciliation bill, and, in exchange, get smoother consideration of the short-term spending bill that passed yesterday and keeps the government’s lights on until December. Conventional use: In the spring, when the House and Senate Budget Committees draft their yearly budget resolutions, they can choose whether or not to include “reconciliation instructions,” which direct particular committees to generate proposals that will later be considered under reconciliation’s expedited procedures. Once the House and Senate have agreed on which committees those should be (and formalize that choice in the text of the budget resolution), those panels go to work on proposals and then send their plans to their chamber’s Budget Committee, which aggregates them together and sends them to the floor. 2015 edition: Current plans call for only the House committees to draft proposals. Once the House had acted, the Senate would simply take up the other chamber’s bill. Is this typical? Not very. 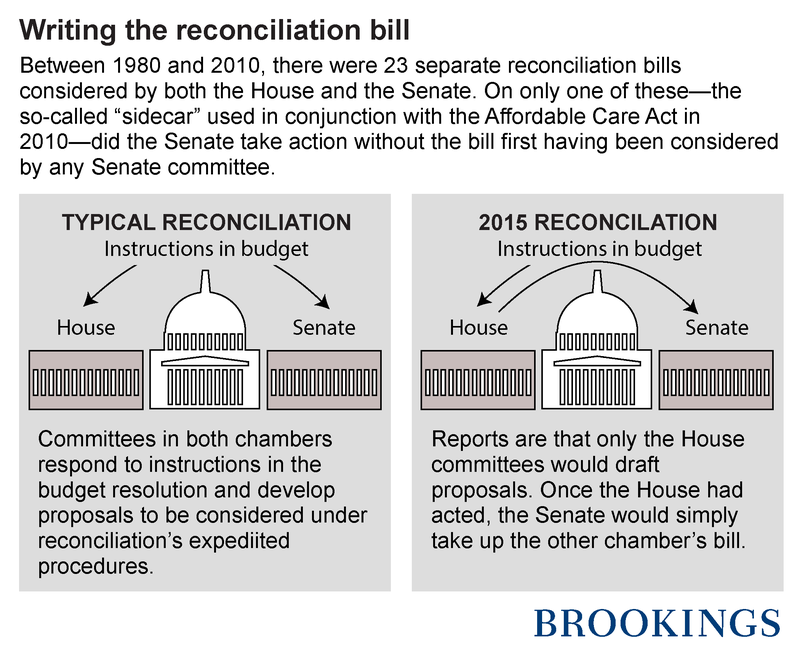 Between 1980 and 2010, there were 23 separate reconciliation bills considered by both the House and the Senate. On only one of these—the so-called “sidecar” used in conjunction with the ACA in 2010—did the Senate take action without the bill first having been considered by any Senate committees. 2015 edition: This year’s budget resolution was completed close to on-time, with final passage in the Senate on May 5. Over the summer, the five committees in the House and Senate charged with drafting reconciliation proposals—Ways and Means, Energy and Commerce, and Education and the Workforce in the House; Finance and Health, Education, Labor, and Pensions (HELP) in the Senate—all found their attention directed to different legislative priorities, including tax reform and reauthorizations of the highway bill and No Child Left Behind. By the time Congress returned after its summer recess, none of the committees had reported out a formal reconciliation proposal involving programs in its jurisdiction. Is this typical? Somewhat. In the years since 1980 that both the House and Senate have considered reconciliation legislation, the chambers delayed floor action until after October 1 eight times. Conventional use: The House and Senate pass their own versions of a reconciliation measure, and then convene a conference committee to hammer out a compromise between their respective bills. 2015 edition: If the Senate does not develop and consider its own reconciliation proposal but rather simply relies on the House’s, it would lessen the need for a formal conference process—especially if the Senate makes minimal changes to the measure during its consideration. How typical is this? If the chambers avoid a conference, it would be atypical. Only twice has a reconciliation bill signed into law not gone through conference at all: 1984 (a relatively narrow measure delaying cost-of-living adjustments for federal retirees and making some small changes to farm loans) and 2010, when much of the reason for using reconciliation during the Affordable Care Act’s endgame was to avoid the conference process. Conventional use: Once the House and Senate have approved the same version of a reconciliation bill, it heads to the president. 2015 edition: The reconciliation measure currently under development, if passed by both chambers, will almost certainly be vetoed by President Obama; he has issued formal veto threats this year on both legislation that repeals the Affordable Care Act and on a measure that defunds Planned Parenthood. Along these four dimensions, then, we see that the current use of reconciliation neither unprecedented nor entirely typical. What should we make of these differences from historical patterns? One important conclusion involves the relationship between the reconciliation rules on one hand, and the scope of the policy change they are shepherding through the legislative process on the other. In 2010, my Brookings colleague Tom Mann, along with Norm Ornstein and Raffaela Wakeman, documented how reconciliation bills have often served as a vehicle in which many legislative initiatives are packaged together into a single, procedurally-protected bill that makes major policy changes. When the process is used to that end, it’s hard to imagine Senate committees surrendering the chance to stake out their positions on the multitude of individual items included in the bill at the beginning of the process. It’s equally difficult to picture senators giving up the opportunity to fight for those preferences as part of a formal conference process. This year’s measure, however, is more focused. Certainly, its policy changes, if enacted, would be quite consequential. The bill, after all, eliminates the requirement that individuals purchase health insurance that sits at the center of the ACA’s reforms. Given the jurisdictions of the committees included in this year’s instructions, however, congressional leaders could have written a much broader reconciliation bill than they ultimately have. Some Republicans had, for example, hoped to use the process for broader tax reform, while others entertained using the process to move a broader ACA repeal bill. The choice to forgo these alternatives has not only inspired criticism from some conservatives, but has also changed the incentives for taking the more conventional approach to a reconciliation measure. Given the choice to write a targeted bill that is headed for near-certain veto—and, perhaps, a rocky path through the Senate—it is not surprising that congressional leaders have chosen the more streamlined approach described here.